When do you need ten fingers? If you're using Windows 8 without a touchscreen, you'd might as well be using Windows 98. At least that's how we felt after checking out the Samsung Series 7 SC770 monitor at CES 2013. Sure, it's a 27-inch full HD display with an incredibly slim bezel, but that's all rather pedestrian. The real story here is the Series 7 SC770's ten-finger touch support. Its sibling the SC750 is the same deal but in a 24-inch package. Does ten points of contact mean ten times the fun? Not necessarily. We're still struggling to think of a program that would require you to use every one of your fingers, simultaneously. On the CES show floor we tested it out using good old Paint. It was just slightly impressive to see ten digits dragging black lines across the screen. Hopefully Microsoft famous passion for developers, developers, developers will attract an app maker to utilize this tech. What really had us impressed with the Series 7 SC770 was the monitor's sliding stand. Using a touch screen standing at a rigid ninety-degrees is awkward, so Samsung's new monitor slides down to a ninety-degree angle. This thing will practically bend over backwards to accommodate you. Of course, two potential issues arise when you've got a touch screen that slides up and down: viewing angles and overall sturdiness of the display. You don't want this thing moving around while you touch it. We're happy to report that neither issue became a problem. No matter angle we put the SC770 at, visuals remained undistorted. And while pressing and swiping for a game of Cut the Rope, the monitor didn't move an inch, unless we wanted it to. The Series 7 SC770 connects via HDMI, and has two ports available. If also uses a USB connection to transfer touch data. It also sports dual stereo speakers, which we weren't able to give a much of a test over the din of the CES show floor. Pricing and availability are still murky. We were only given rough estimates. Samsung expects a first quarter release for the Series 7 SC770 and SC750, but there is a possibility it could slip into the second quarter. A representative told us he expected the 27-inch touch display to retail for less than $1,000. 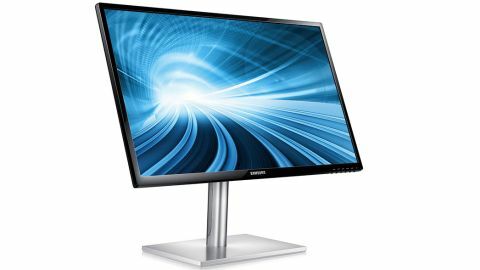 Samsung's Series 7 SC770 is an easy candidate for a flagship Windows 8 monitor. Its size and intense resolution make it gorgeous, and who knows? Maybe we'll see an app or two that make ten points of touch a necessity? However, it was the sliding stand that really impressed us. It's become a touchscreen cliche, but we felt like Tom Cruise in Minority Report standing in front of the SC770, comfortably tapping away at the screen. So what if we were just feeding Om Nom and not solving future murders? Someone's got to do it.